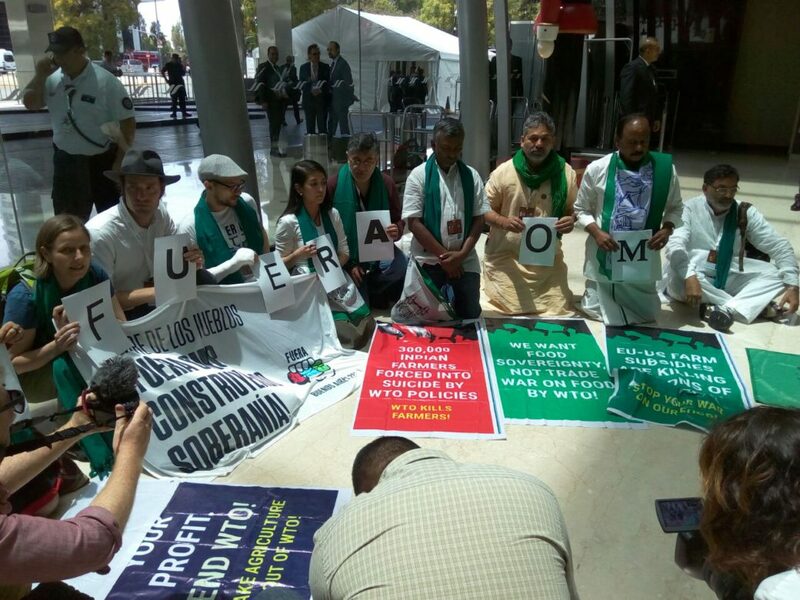 15 Dec, Buenos Aires: The Global Forest Coalition (GFC)  celebrated the failure of two key trade negotiations, the World Trade Organization (WTO), and EU-Mercosur free trade agreement, to reach a successful conclusion during negotiations in Argentina . Both were projected to have detrimental impacts on forests, food sovereignty, and rights of local communities, issues that GFC defends. The WTO collapsed because of disagreements between the US and developing country’s like India, China, Brazil and others over public food stockholding , while the EU Mercosur Free Trade agreement was delayed to next year because of disagreements over ethanol and beef import quotas. Mercosur countries Brazil, Argentina, Paraguay and Uruguay want the EU to improve its current offer of tariff free imports of meat from 70,000 tonnes and ethanol from 600,000 tonnes a year as they are lower than what the EU offered in 2004. “The EU-Mercosur agreement will lead to serious deforestation in South America because of increasing exports of beef, ethanol and soy- all commodities which raze our forests. Combined with climate change and droughts, impacts will be catastrophic ,” said Ines Franceschelli of Henoi Jey, Paraguay and co-author of a report on real cost of meat production . The UNs 2016 State of the World’s Forests report  and GFC’s own reports  highlight that livestock and animal feedstock production are the main drivers of deforestation in South America. 71% of deforestation between 1990 and 2005 was driven by increased demand for pasture. In Brazil the figure was even higher, at 80%. Global Forest Coalition is an international coalition of NGOs and Indigenous Peoples’ Organizations defending social justice and the rights of forest peoples in forest policies. It has 91 member organizations from 59 countries.